What is it that scientists do all day while they are watching their shrimp walk on a treadmill? How do scientists know how Tyrannosaurus may have chewed or ran? How do they know if a molecule will work as a drug to target some disease? Scientists often find it difficult to translate their work’s importance to the public in a way they can understand without losing some of its content. Often “laypeople” are left confused with what looks like a waste of money in the name of big science. So, how can the general public learn more about the inner workings of a research laboratory? Perhaps the key is to train student researchers early in their careers on how to write about science to the average person. As a social experiment this year, members of the Holliday lab will try to bridge this gap by writing their own short pieces on relevant and interesting science. By learning to translate often wonky, jargon-laden research to more palatable, engaging prose, lab members will hope to shed light on what happens in our lab, what questions we are asking, what discoveries we hope to make, and most importantly, why anyone should care. Of course, this should help the writers learn about science as well. Although the lab focuses on Vertebrate Functional Anatomy and Evolution, do not be surprised if other topics creep in. I hate the term cheeks as it always suggests the mammalian variety with a buccinator muscle (for which there is ZERO evidence for in saurpsids [yes, dinosaurs are also sauropsids!]). The German anatomists (Luther, Lakjer, et al.) used either Mundplatte, and then later, the rictal plate, or rictus to describe the corner of the mouth in sauropsids (see my 2007 J Morph paper if you want more lit cited). Its rich with nerve endings, vasculature, glands etc and is easily seen in the corner of that snapping turtles mouth (see link above), crocodilian mouths, most birds. The rictus tends to directly cover the corner of the mouth where the temporal and pterygoideus muscles cross paths as they attach to the mandible near the coronoid process, usually just underneath or caudal to the orbit. Mammals have a rictus too– its the really sensitive edge of the cheek that lacks muscles but is packed with sensory receptors–go ahead, pinch it. 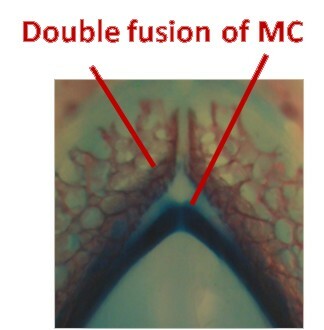 Some snakes developed venom glands within the rictus (McDowell SB. 1986. The architecture of the corner of the mouth of colubroid snakes. J Herpetol 20:353–407.). Anyway. I don’t see what’s so contentious aside from having a cutesy Dinocheek media event. Well endowed Mundplattes are not uncommon among sauropsids as people keep pointing out. Why does there have to be one Dinosaurian bauplan for “cheeks” (ugh). Clearly with all the evolution that has happened in these groups, needing more/less skin over the mouth must have been necessary for chewing vs gape? Clearly having a freaking giant osteoderm there lends cred to ankylosaurs having cheeks. but IMO, I never thought the old addage (err hypothesis?) “food would fall out of their mouth otherwise” to ever be a good approach to support the presence of skin there otherwise. But perhaps there is upcoming evidence via SVP abstract to support it (yay!). 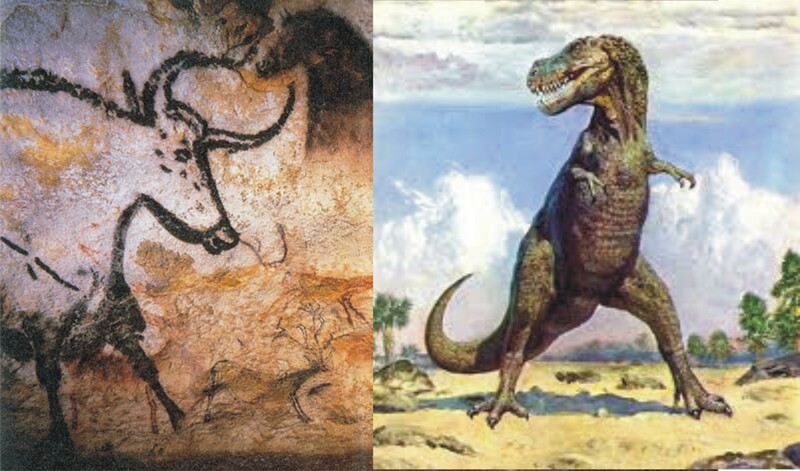 I feel like this whole debate is driven by paleoart, and not some true scientific endeavor (no offense artists-I understand the pains you often take to get things accurate). I sent most of this same information to Tylor Keillor, like 5 years ago to help with his sculptures-so its way cool to see his work progress that way it has been (see Project Dryptosaurus). To me, a true cheek is when the rictus becomes decoupled from the true corner of the mouth (back near the coronoid process) and extends rostrally beyond to serve some function with the oral cavity. So the cheekiest archosaur? My vote is the flamingo. Flamingos stretch the corner of the mouth past the corner of the mouth, past the orbit, past the antorbital cavity! past the transition from bony mandible to beaky mandible (holy crap!). And there is fairly clear function for this given the flamingo’s derived lingual pumping/filtration method of feeding. Here is an unpublished picture from our 2006 Anat Rec Flamingo Head Vessel paper. Now that’s a @#$@# dinosaur cheek! Rockefeller State Refuge is an expansive area of the western end of Louisiana’s swampy coast which prides itself as being one of the key DNR sites to aid in the rescue of American Alligators when they were endangered several decades ago (Link to Map and Location). 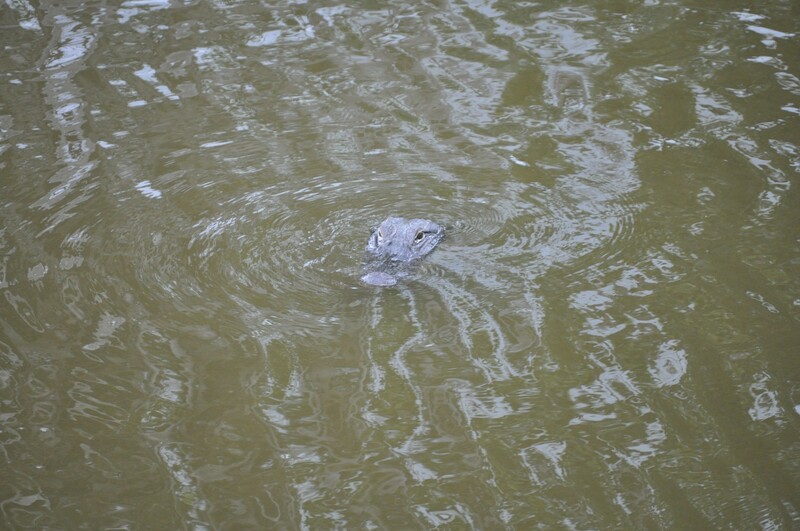 Today, besides maintaining a large wildlife management area full of birds, fish, herps, and sporting enthusiasts, they manage the region’s alligator population, work with commercial farmers and supply most of the alligators used in research in North America. If you didn’t already know, research in alligators is booming. There is strong interest in alligator and crocodilian genomics, hematology and disease resistance, biomechanics (for example…the death roll..), cardiopulmonary and developmental physiology, let alone our persistence in using them as a comparative anatomical model for vertebrate paleontology, functional anatomy and evolution. In February 2011, Henry Tsai and I drove down to collect alligator cadavers and made it back to Columbia at 3am, about 1hour before a blizzard hit and snowed us in for 2 days. It was a drive of legend in which we threaded the needle between two separate winter storms driving up through Western Arkansas. 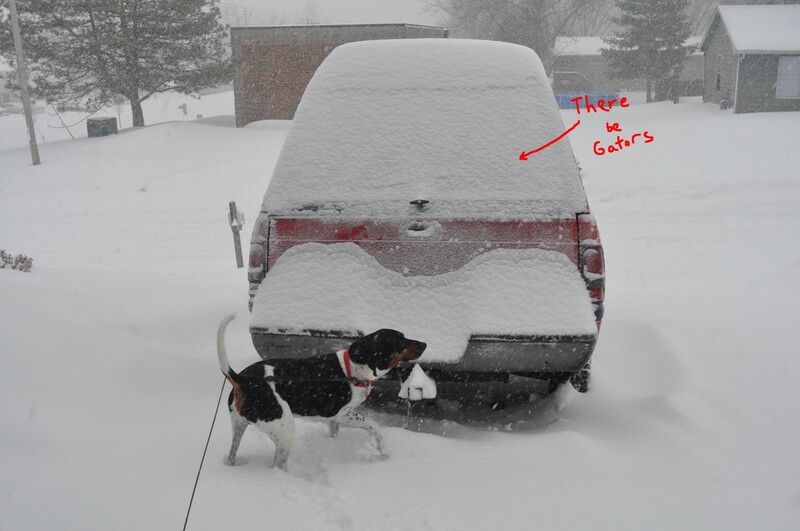 The alligators were quite comfy in the back of the truck, in my driveway while we were snowed in. 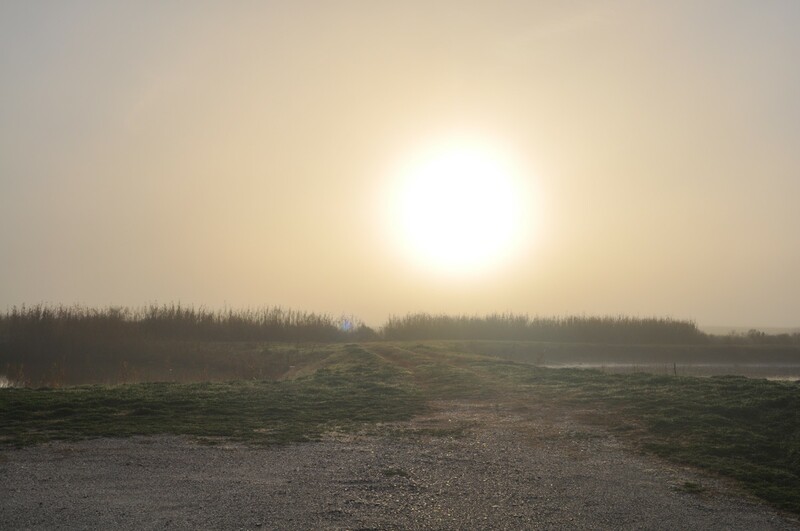 The morning after picking up gators, after a 15hr drive through winter weather, Feb 1, 2011. Needless to say, there are few contrasts in weather than experiencing sunrise over a balmy swamp one morning, and then 24 inches of snow the next. The gators were used for research as well as a fairly popular high school workshop “Inside Alligators”we put on a week or so after we returned. 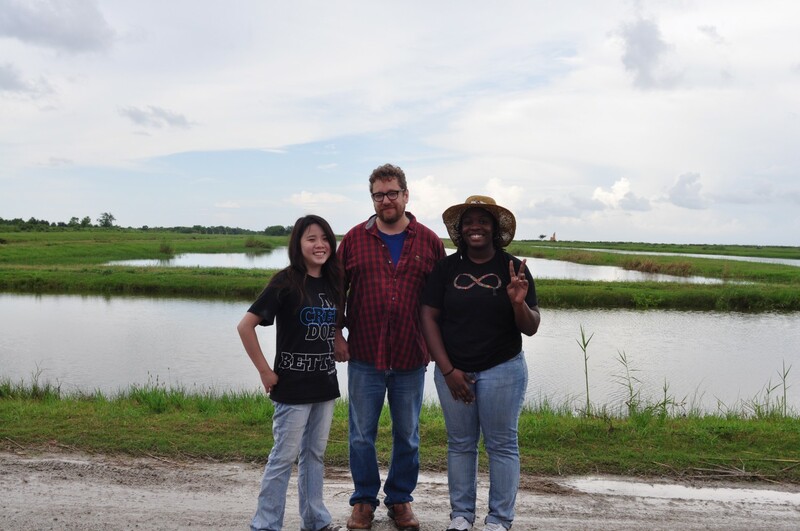 This June, I was accompanied by Ohio U/Witmer lab alum and current Mizzou Lecturer Dave Dufeau, and two undergraduates, Cortaiga Gant and Julie Tea. Cortaiga has been part of Project Gator Chin for a while whereas Julie is a Visiting Summer Fellow from University of Houston. 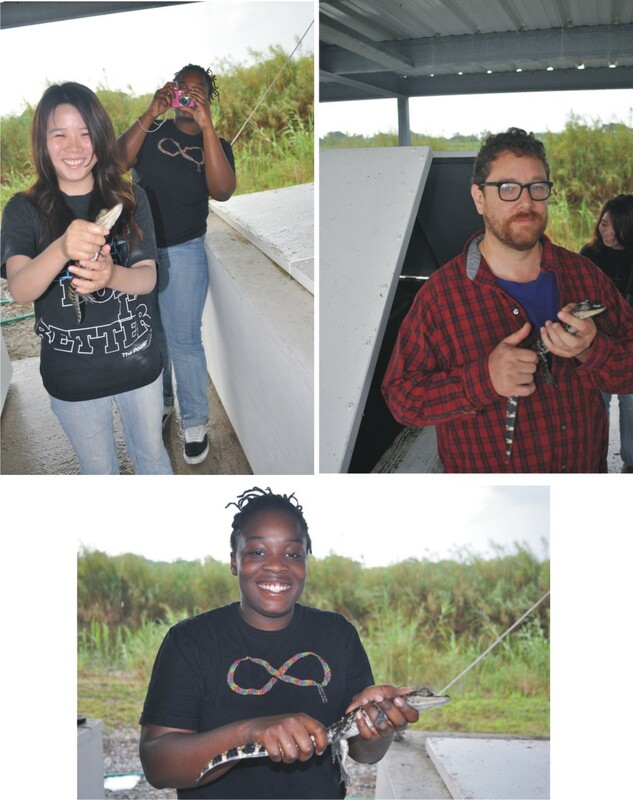 This trip made for a good experience for them–none of whom had ever visited a place like Rockefeller and everyone got a chance to see, hold, and work with alligators. We stopped in Baton Rouge on the way down, stuffed our faces with shrimp and oysters at The Chimes and had a relatively leisurely drive down the coast the next day to get to Rockefeller. We then drove the entire way back to make sure the eggs and cadavers were taken care of. We visited Rockefeller this trip to load up a bunch of eggs we are currently incubating in the lab. Alligator eggs typically take about 65 days to hatch and are laid in a large, mother-guarded, mounded nest in late May/Early June. 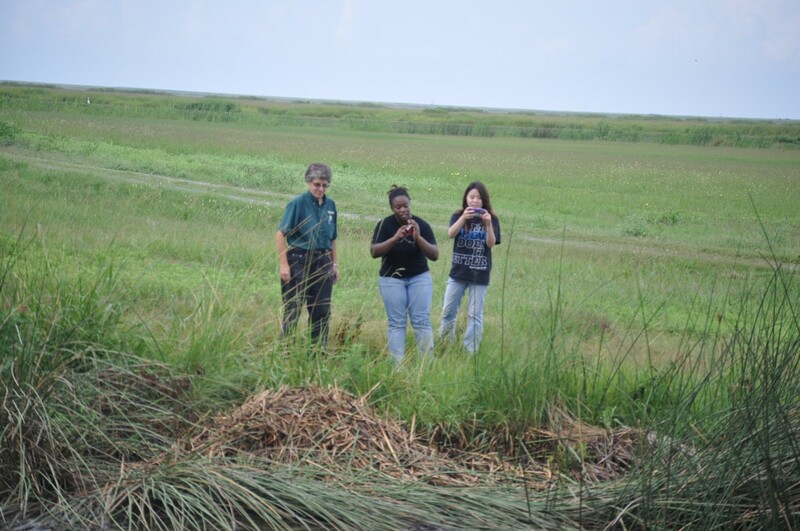 The Refuge staff use helicopters and airboats to identify and flag nests every season. They also collect recently-laid eggs and keep them in large outdoor incubators. The eggs are given to researchers or are hatched and raised until they are released into the wild or used otherwise. Rockefeller has something different going on every time I visit. I’ve seen other students there collecting blood and gut bacteria. 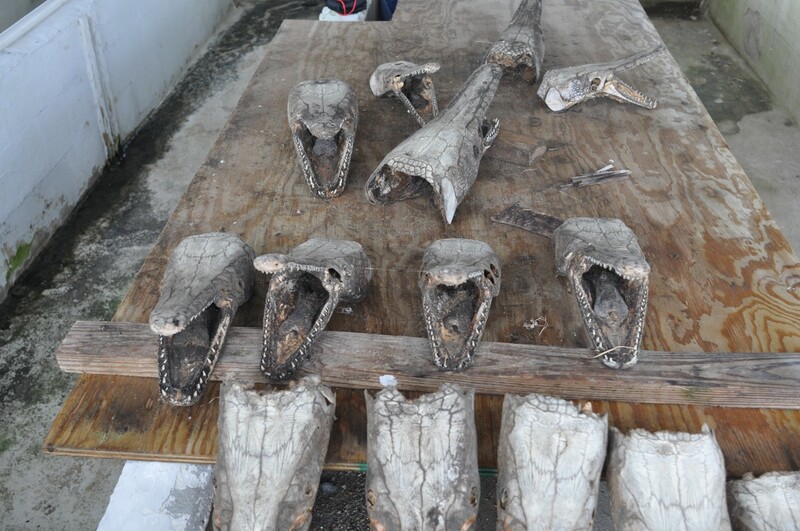 This time they had a number of alligator gar carcasses being prepped for someone’s study. 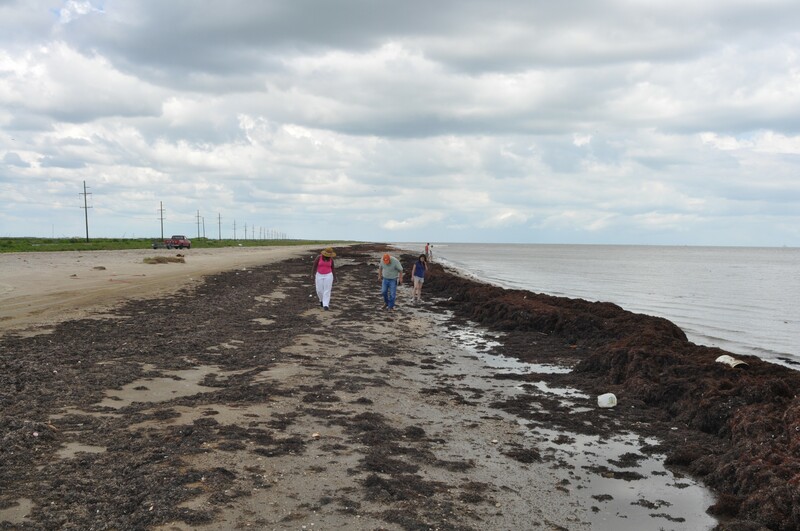 Rockefeller received some serious damage from Hurricanes Rita and Katrina in 2005. One the “major” losses was their large outdoor, walk-in freezer, which had dozens of frozen specimens including the head of a gator that must have been pushing 10feet long…all swept away. None of this would be possible without the support and effort of Supervisor Ruth Elsey. Ruth has championed research and made the resources of the Refuge available to researchers and students from around the world. Ruth is always keen to help out people with research projects and educational materials and is always a welcoming host at Rockefeller. Ruth showing Julie and Cortaiga a local gator nest. Momma is just under the reeds at the bottom of photo. Yes, it’s been over a month since SVP met in Las Vegas. Shoot, I never blogged about my Argentina trip either. I’m so behind. I flew out during the day from Memphis, and being a clear day, I was able to basically lean my head on the window and watch Texas, New Mexico, and Arizona pass under us-always an amazing view. 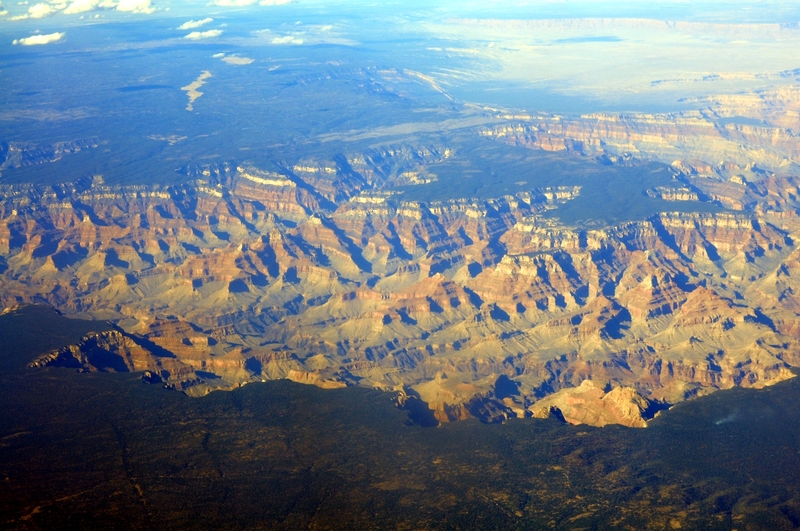 I took a few good pictures of the Grand Canyon from 30k ft up. It was a good meeting, we had 2 Undergraduates and 2 PhD students give talks and a poster, and lab alumnus Nick Gardner also gave a great talk. I was really proud of all of their effort in making SVP go so well. To reward them, I punished them by taking them to the Banquet dinner and sitting through the awards ceremony. It was a horrifically sick joke, perhaps the meanest one I have ever subjected someone to. For that, I apologize. SVP had some personally notable sessions including the Croc sessions (duh), the symposium on Laramidia, and the symposium on limb development. Of course there were interesting presentations scattered about the other sessions and posters. Gant CA, Skiljan BJ, Tsai HP, Folk B, Holliday CM. Alligators near and far: Using the Maps in Medicine: Inside Alligator high school workshop and 3D Alligator website as educational tools in anatomy and evolution. Gardner NM, Bullar BA, Holliday CM, O’Keefe FR. 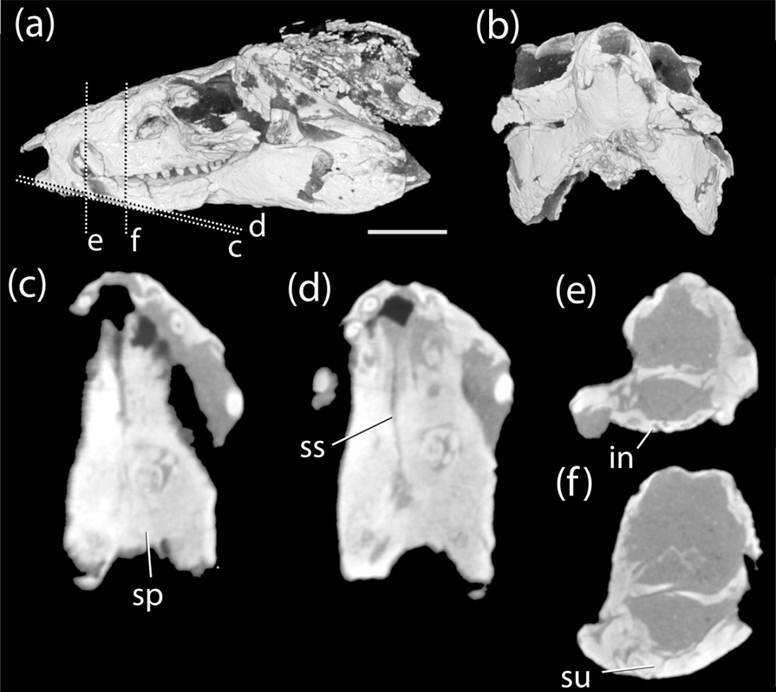 Cranial anatomy in the basal diapsid Youngina capensis and its relevance to higher radiations of Permo-Triassic neodiapsida. George ID, CM Holliday. 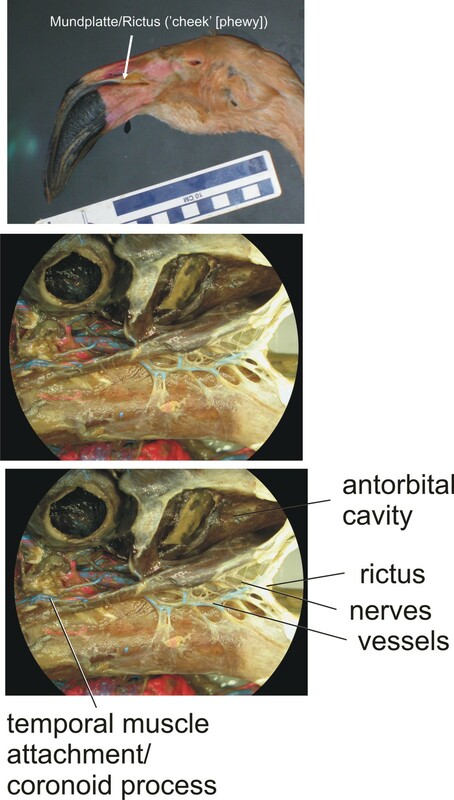 Trigeminal nerve morphology in Alligator mississippiensis: Implications for inferring sensory potential in extinct crocodyliforms. Holliday CM, Gardner NM. 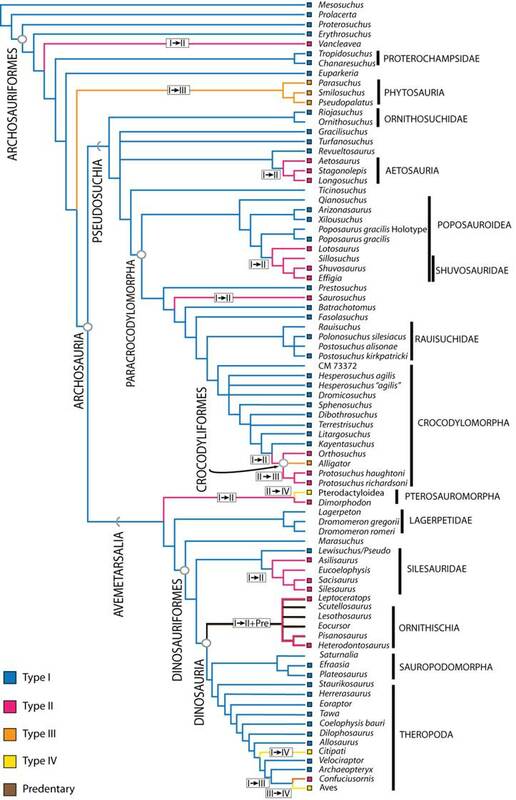 A new eusuchian crocodyliform with novel cranial integument and the origin of Crocodylia. Skiljan BJ, Gant CA, Holliday CM. Structure and function of a protosuchian mandibular symphysis using anatomical insights from Alligator mississippiensis. I’m happy to say that Ian’s paper on Alligator trigeminal nerve scaling is in review and the Shieldcroc paper is hopefully through its last minor revisions at PLoS ONE, so we should hopefully see those publications on the horizon. We’re currently developing Becci and Cortaiga’s work on Alligator and Protosuchian symphyses into papers. The Shieldcroc presentation was selected by SVP to be a part of the media event. That made for some excitement before, during, and after the meeting. I’ll save my thoughts on that whole experience for when the actual paper comes out. Among all these things, I had the most fun talking at the Outreach and Education posters which included a number of great methods, techniques, and ideas about how to broaden participation of various demographic groups in paleontology, anatomy and evolution education. We presented our own poster which served as a hybrid approach to how we are using Alligators as educational tools in regional High School education and Internet outreach. I’ve written about both of these events here previously: 3D Alligator; Inside Alligators. You can download a small version of the poster here. 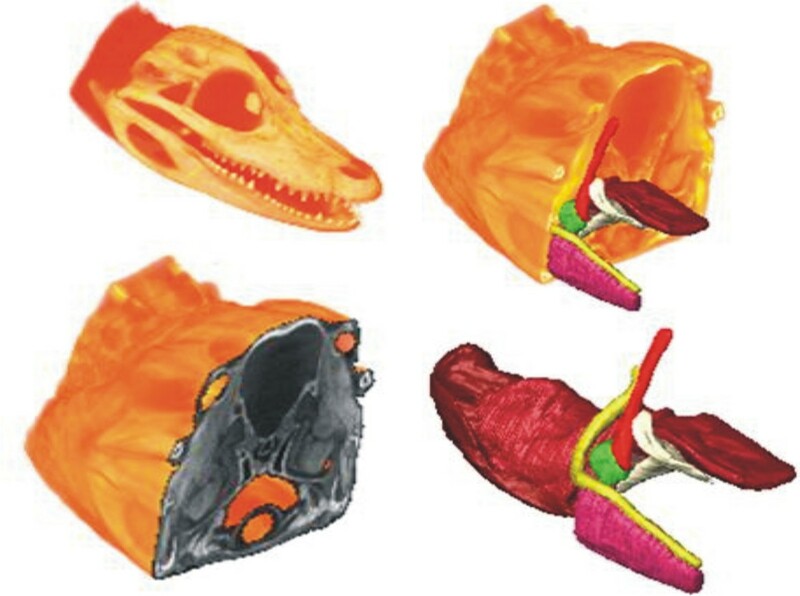 We are happy to present a new project authored by Henry P. Tsai and myself entitled “Ontogeny of the Alligator Cartilago Transiliens and Its Significance for Sauropsid Jaw Muscle Evolution” which is out in PLoS ONE this week. The link to the paper is here. The paper describes a nodular structure characteristic to crocodilian jaw muscles known as the cartilago transiliens. Despite its familiarity to morphologists, anatomists, and the like, few studies have focused much on it. We tested the hypothesis that the structure is actually a sesamoid, or an intramuscular nodule, linking two historically disparate muscles. Historically, its been treated as a special structure without any particular developmental history. By using imaging, dissection and histology methods on a sample of different-aged alligators, we found that, based on a number of criteria, indeed the cartilaginous nodule is likely a sesamoid. Not earth-shattering research but it holds significance for understanding how the jaw muscles function, how they develop, how they evolved among reptiles and the nature of the pterygoid buttress system of crocodilians. 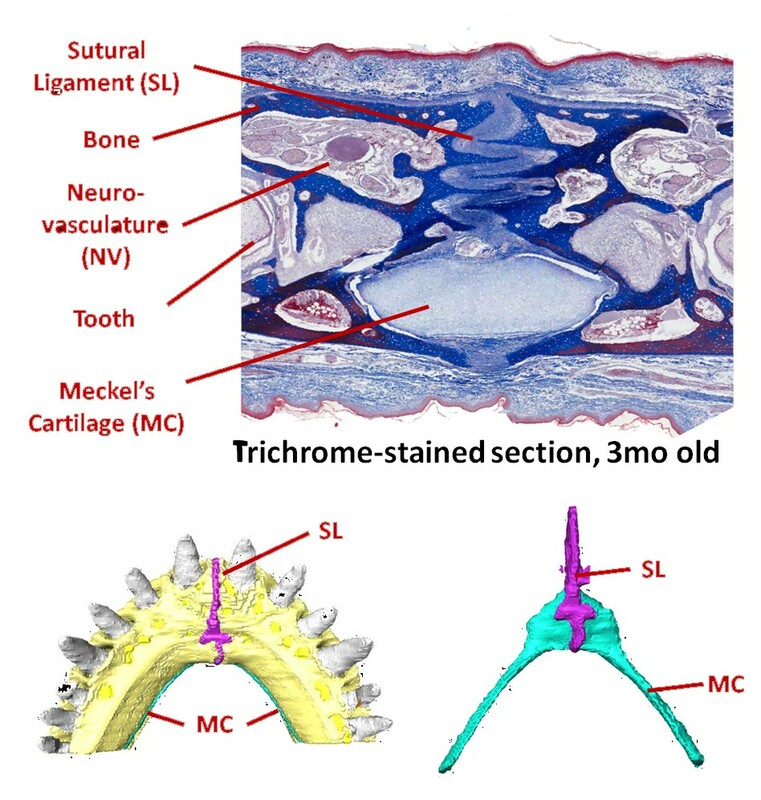 I had stumbled on this idea about the sesamoid/cartilago transiliens back when we published the 2007 J Morph Archosaur Jaw Muscle Homology paper. So, it’s good to see another paper spawn out of that work. Besides integrating classical dissection and histology, the project was fun because we got to employ a relatively new staining technique using Lugol’s Iodine (I2KI) and MicroCT to visualize the 3D anatomy of the jaw musculature. I hinted at some of this last year and it’s good to see our first shot make it to press. Its remarkable how different iodine-enhanced CT is compared to MRI, which is sometimes used for muscle anatomy…though it’s best for brain and nervous tissue. We have put together a 3D model and pdf of the dataset, which is featured extensively in the paper. We bumped into a couple of technical difficulties at the last minute this week, so we aren’t able to launch at the same time the paper comes out (darn) however, it’ll be up soon enough. We’ll be employing this technique often in the Holliday Lab as it’s proven essential to understanding the 3D anatomy of muscles and other soft tissues that were always a challenge to convey on 2D figures, and almost impossible to get at using standard CT scanning and even MRI. Had this technique been around during my dissertation, it would’ve been a completely different monster. So jaw muscles v2.0 here we come. The real milestone here is that this paper marks the 1st paper published with my 1st graduate student. hoo-rah. Henry is keen on limb anatomy moreso than heads, but in our Integrative Anatomy program, we have graduate students perform research rotations within their advisor’s lab as well as in other neighboring labs in IA or in other departments. This let’s them learn several subjects and techniques while they develop ideas for dissertations, get to know labs, etc. We thought this project would be a great compromise on learning bread & butter techniques in the lab, connective tissue biology & cartilage while working on a small soft tissue anatomy project on an animal we’re both quite fond of. Henry rocked it and was key in seeing its publication basically one year after he started graduate school.